No. 1 Olathe NW (21-1) -- The Ravens will be making their fourth consecutive trip to the 6A state tournament and the second straight as the No. 1 seed in the tourney. Olathe NW was beat in the semifinals last year and had to settle for a third place finish, but they’re back and looking for that championship plaque. The Ravens cruised through their regional with wins over Topeka and a run-rule win over Manhattan to find themselves back in Lawrence for the weekend. The Ravens are led by Northern Colorado signee, Mady Young. Young stands at just 5-foot-3, but has a lot of power and is extremely tough to throw out on the basepaths. Young has already broken numerous school records and will hope to help guide the Ravens to a second state title. No. 8 Campus (10-10) -- The Colts are back in the state tournament for the first time since 2013 after stunning the regionals top seed, Wichita Southeast 10-9 in the regional final. The Colts trailed the Buffaloes 5-2 in the third inning, but Campus had an answer with a five-run fourth inning to grab the lead again. The Colts pounded out 15 hits in the game and were aided by two home runs from Lauryn Johnson. Johnson’s second home run was a solo shot in the top of the seventh inning that proved to be the game-winner. No. 4 Blue Valley (17-5) -- The Tigers play in the loaded Eastern Kansas League and it took a 6-5 10-inning game win over rival Blue Valley West to get them into the 6A field. Blue Valley also won their opening round of regional play by a score of 18-0 over SM West. The Tigers enter the state tournament on a six game winning streak. No. 5 Garden City (17-5) -- The Buffaloes are headed back to state for the third time in four years, quite an accomplishment for the Garden City seniors that have been playing since their freshman year. The Buffaloes made quick work of Wichita East and Hutchinson in their regional. Both games ended after three innings with consecutive 15-0 run-rule victories. The Buffaloes offense put together 30 hits to go along with the 30 runs all in six innings of play. The Buffaloes pitching staff is the ultimate dynamic duo, sisters Abbie and Hailey Dart. Hailey struck out three, while allowing just two hits in the first win over East, while Abbie allowed just one-hit and struck out five Salthawks. No. 2 Olathe East (18-4) -- The Hawks seniors will make the trip to Lawrence for the fourth time in their time wearing an Olathe East softball jersey. The 6A powerhouse punched their ticket back to Lawrence with wins over Shawnee Mission South and Shawnee Mission NW, both teams that the Hawks didn’t allow a single run to. Hayley McGhee threw a gem in the regional title game, going the distance with 19 strikeouts and allowing just four hits. It’s safe to say that McGhee is one of the top pitchers in the state this year and will be taking her talents to NCAA Division II University of Arkansas at Monticello. The Hawks can hit the ball too and are led by Katie Enneking, Jadyn Smith and Elise Byers. No. 7 Olathe North (12-10) -- The Eagles are back in the state tournament after missing out a year ago after an appearance in 2015. The Eagles took third place in 2015 after the third place game was cancelled due to weather. The Eagles, which had the No. 6 seed in their regional got past No. 3 Washburn Rural and then No. 2 Gardner-Edgerton in eight innings to advance on. Alexis Hodapp (.483 avg, 21 RBI) leads the Eagles offensive attack and has been a threat to go deep as well. Lexie Schroeder (.397 avg, 10 RBI) and Maya Gallagher (.391 avg, 17 RBI) have both been trouble to get out in the Eagles lineup. No. 3 Olathe South (17-5) -- The back-to-back 6A state champions are going for a three-peat this year. The Falcons may have five losses on the year, but they’ve also outscored their opponents 201-43 and of their five losses, four of them will be playing this weekend for a state crown. The battery of pitcher Maryssa Rollin and catcher Casey Shell have been a big part of the Falcons success this year. Abby Allen and Abby Clark have both provided big performances at the plate, as well as in the field with their defense. No. 6 Derby (16-6) -- The Panthers will have their hands full with two-time defending state champion, Olathe South in the first round, but Derby is ready for the task. The Panthers will be making their seventh straight state tournament appearance. Derby was 2-6 at one point in the year, but have rattled off 14-straight games to punch their ticket back to Lawrence. The Panthers dismantled Wichita NW, 21-8 in the regional championship game, thanks to a hitting parade put on by the Panthers. Derby put together 22 hits in the title game and hit two home runs, one apiece off the bat of Addie Parks and Mariah Wheeler. No. 1 Shawnee Heights (22-0) -- The Thunderbirds are back in the state tournament and will try to make another run in the 5A tournament after finishing second a year ago. The T-Birds showed off their power in the Lansing regional. Heights beat Topeka West, 18-2 to advance back to Wichita. In that regional final game, the T-Birds produced three home runs and had 14 hits. Abigail Fischer and Kaisha Wells both homered in Heights’ 11-run third inning. Kaleigh Bayless went 3-for-3 with a single, double and triple for the T-Birds, while Sydney Wellshear also added a 3-for-3 day with the game winning grand slam to end the game via run-rule. No. 8 Salina South (12-10) -- The Cougars battled their way through the Newton regional with wins over rival Salina Central in the regional semifinal and then an upset of No. 2 Kapaun Mt. Carmel in the finals to advance to Wichita. South started the year with just three seniors and saw their No. 1 pitcher from a year ago playing at Fort Hays State, so the Cougars believed this year would be a rebuilding year. The Cougars are headed to state for the first time since 2010, when they finished fourth. Morgan Russell and Caitlyn Rapp both had a three-hit game in the championship game, apart of the Cougars’ 14 hits. No. 2 Bishop Carroll (22-1) -- The Golden Eagles are used to playing at TRYC in Wichita, as that is where they play their home games during the regular season and they’re also used to playing in state games there too. Carroll’s chance of a six-peat came up just short last year, as Andover stunned the Golden Eagles in the quarterfinals in the 8 vs. 1 game. This year, the Golden Eagles get the No. 2 seed and come in with just the one loss to Maize South and since that loss Carroll has won 13 straight. Carroll is batting .507 as a team with 13 home runs and 55 stolen bases. Meghan Guttierez (.636 avg, 23 RBI), Callie Gowing (.580 avg, 18 RBI) and Kaylin Watkins (.562 avg, 37 RBI) lead the high powered Carroll attack. Watkins (12-0 record, 1.26 ERA) is also the No. 1 pitcher for the Golden Eagles. No. 7 Mill Valley (13-9) -- The Jaguars will enter Thursday’s state tournament having won nine of their last 10 games and they’re coming in off of an impressive regional win. Mill Valley entered the St. Thomas Aquinas regional as the No. 4 seed and picked up a win over St. James in the regional semifinal before upending the regionals top-seed and host, Aquinas, 5-3 to punch their ticket to Wichita. The Jaguars started hot against Aquinas in the final with three runs in the first inning, followed by one apiece in the fourth and the fifth inning to take the 5-0 lead. Aquinas would battle back and push three runs across, but too late. Peyton Moeder, Haley Puccio, Lilly Blecha and Grace Lovett will hope to keep the offensive firepower going against a very talented Carroll team. No. 4 Valley Center (19-3) -- The Hornets are headed to their third consecutive state tournament after the Hornets beat Newton and then Andover to advance back to state. Wylie Glover gave the Hornets the lead after a bases clearing double in the fifth inning. The Hornets would hold onto the lead and take down the Trojans, 5-2. Kaylee Burnett went the distance in the circle for the Hornets allowing four hits and just one earned run. The Hornets are a senior heavy team and will look to make some noise on Thursday after coming up empty their last three appearances at state. No. 5 Seaman (18-4) -- The defending state champions are headed back to Wichita to try and win a second straight 5A state tournament. Seaman defeated Highland Park and Lansing to book the return trip to Wichita. Lansing cut the Seaman lead down to just one, 5-4 in the sixth inning, but Seaman’s Trinity Morris connected on a two-out, two-run double to put the Vikings up 7-4. Morris’ hit would be the difference maker after the Lions added two more runs to pull within one, but the Seaman defense came up big for the win. No. 3 Maize (20-2) -- The Eagles will make the short drive to the west side of Wichita to compete in Thursday’s state tournament after missing out the last two years. Maize defeated Liberal and Goddard Eisenhower to earn the trip back. The Eagles have been on fire at the plate and are hitting .369 with 30 home runs. Savannah Hughes (.529 avg, 38 RBI, 13 HR) is a big key to the Eagles’ offense, while Maura Glatczak (.433 avg, 23 RBI, 4 HR) and freshman Sophia Buzard (.418 avg, 22 RBI, 7 HR) are also putting up big numbers for the Eagles. Lauryn Ogden (10-1 record, 1.47 ERA) proves to be the No. 1 starter for the Eagles in the circle, while Madi Arnold (8-1 record, 2.35 ERA) has also been a part to the success. No. 6 Blue Valley SW (14-8) -- The Timberwolves are making their second consecutive trip down to Wichita for the state tournament and are hopeful for a better outcome than last year. BVSW entered the 2016 state tournament as the No. 5 seed and lost in the quarterfinals, so they’re hopeful of a longer stay in Wichita this weekend. The T-Wolves defeated Pittsburg and then KC Turner to advance back to state. The-Twolves dismantled KC Turner in the regional championship, as they led from the beginning and never looked back in the 18-0 route of the Golden Bears. No. 1 Independence (19-1) -- The Bulldogs are heading back to Salina for the second straight year and will try and build on last year’s third place finish. Independence clinched the state berth with wins over Chanute and Labette County to advance out of their own regional. Hannah Burnett, Aubree Lawrie and Lyssa Schabel are all hitting around the .500 mark this year and will hope that their experience from last year can help them come Thursday. No. 8 Wamego (13-9) -- The Red Raiders return to state for the first time since 2014 and third trip since 2012. Wamego beat Buhler and McPherson to punch their ticket to Salina. The Red Raiders have a lot of power in their lineup and it’s a lineup that saw six different players hit home runs in the regional. Sophomore Sydney Hefty is leading the team with a .485 batting average and also leads the team with eight stolen bases. Amber Hildebrand is the No. 1 pitcher for Wamego and also can hit the ball, as she’s hitting .419 with four home runs. No. 2 Paola (20-2) -- The Panthers earned their way into the state tournament for the first time since 2013 with wins over Ottawa and Fort Scott. Paola scored all six of their runs in the first three innings and were able to hold off a late Fort Scott rally to earn the berth. Jordan Johnson helped herself out in the circle with a two-out, two-run home run in the bottom of the first inning to get things going for the Panthers. Paola added three more in the second and one in the third to tally their six runs. Johnson finished 4-for-4 at the plate with the 2 RBI and also pitched a complete game for the win. No. 7 Winfield (15-6) -- The Vikings are headed to state for the first time in 12 years after beating Mulvane and Wellington to punch their ticket. Winfield edged Wellington, 7-6 in the regional championship game after Wellington had beaten the Vikings 3-1 last year in the regional final. Kerry Murphy is having a great senior campaign and leads the Vikings in almost all offensive categories. Murphy will be taking her talents to Johnson County next year. No. 4 Spring Hill (18-4) -- The defending state champion Broncos are back and ready to repeat as the 4A-I state champions, but first off they’ll have to win three games to do so. The Broncos went through the 2016 state tourney with the No. 2 seed, so we’ll see if they can get through as the No. 4 this year. Regan Smith (.410 avg, 33 RBI, 4 HR) and Sierra Sanderson (.407 avg, 14 RBI) are the lone two Broncos hitting above .400 on the year. Sarah Brown (12-1 record, 0.74 ERA) has been almost unhittable this season and is striking out almost two batters per inning. No. 5 Andale/Garden Plain (17-5) -- The Indians are back in the 4A-I state tournament after missing out a year ago. Andale/GP beat Hays and Maize South in the Ulysses regional to advance to state. Bailey Bugner, Peyton Chavez, Rachel Bergkamp and Macie Eck are some of the notable Indians on the roster. Andale won four state titles from 2008-2012, but haven’t won one since then, so this team will try to get back on the right track. What's even more impressive for the school as a whole, Andale is the favorite to win 4A girls track and field on Saturday. No. 3 KC Piper (20-2) -- The Pirates are heading to their fourth straight state tournament after beating Atchison and edging Tonganoxie to get back to Salina. Although the Pirates have been four straight years, these seniors are still without a state title, so that’s the plan come this weekend. Piper took second last year, third the year before and bumped in the quarterfinals the year before that, so if this is a pattern then the Pirates could be hoisting the plaque on Friday in Salina. No. 6 Andover Central (16-6) -- The Jaguars probably took the craziest route ever to advance back to the state tournament. Andover Central was down 7-1 going into the top of the seventh inning, but they didn’t give up down six. The Jaguars scored 12 runs in the frame to shock Circle of their bid, instead the Jaguars prevailed to win 13-7. The Jags will try and keep the momentum they had in that seventh inning into Thursday’s quarterfinal matchup with KC Piper. Morgan Herrmann, Audrey Warrington and Brooklyn Strobel each had big performances in the come from behind win for the Jags and they’ll look to do the same on Thursday. No. 1 Pratt (19-1) -- The Greenbacks are headed to state for the fourth time in five years and the third time that these seniors will have advanced to the final weekend in May. Pratt defeated Central Kansas League foes Nickerson and Hoisington in the Larned regional to advance to the state tournament. Paige Huber tossed a gem for the Greenbacks in the regional title game, going the distance, allowing two hits and striking out 11 Cardinal batters. No. 8 Topeka-Hayden (6-16) -- The Wildcats proved that the Centennial League is one of the toughest in the state. Hayden carried a 4-16 record into regional play, but picked up two more wins to advance to the state tournament. The Centennial League has prepared the Wildcats for the postseason and once again it paid off. Hayden rallied from down 5-0 to upset top-seeded Holton, 7-6 and then would use another rally in the championship game. The Wildcats trailed Rock Creek, 4-0, before coming back and winning 9-7. Freshamn Breanna Droge picked up both wins in the circle for the Wildcats and also added three hits in each game. No. 2 Haven (19-3) -- The Wildcats seniors have been apart of a lot of recent success and that success continued with a fourth consecutive regional title for the seniors. Haven beat Wichita Trinity Academy and Kingman both by 10 runs to advance to this week’s state tournament. This is a Haven team that has a lot of power in their bats and have hit multiple home runs this year. Taylor Bredfeldt, Emmiley Hendrixson and Haley Harner have all shown off their home run power this year and they’ll try to keep the hot bats going in Emporia. No. 7 Goodland (12-10) -- The Cowgirls took down Scott City in an exciting 12-11 victory in a game that lasted 11 innings. This will be the Cowgirls’ third trip to the state tournament in four years. Kaitlyn Daise got the win in the circle for Goodland, going 10 ⅔ innings with nine strikeouts. Brooke Drennan was 4-for-5 at the plate for the Cowgirls with four runs scored. Demi Mitchek also had a nice day, going 3-for-6 with two runs scored. The Cowgirls took advantage of the five errors committed by Scott City en route to the victory. No. 4 Clay Center (16-4) -- The Tigers are headed to the state tournament for the first time in six years. Clay Center beat Concordia and then Chapman to punch their ticket to Emporia. This will be Clay Center’s first appearance since 2011 and seventh time since 1996. Megan Blake is hitting .477 and also is 9-3 in the circle with four saves. Allie Wright-Frederick (.400 avg.) is another big contributor to the offense. No. 5 Girard (16-4) -- The Trojans, led by head coach Jim Vinze, are back in the state tournament for the first time in two years. Girard entered the 2015 state tourney as the No. 1 seed, but lost in the semifinals and had to settle for a third place finish. Girard is coming in out of the loaded CNC league down in southeast Kansas that produces state tourney teams every year and it’s usually Girard and Frontenac playing for a trip to state. This year the Trojans beat Baxter Springs and Frontenac to get back. Girard only features one senior on its entire squad, Calea Augustin, an all-state selection on the Trojans 4A-II basketball team. The Trojans are also led by juniors Sydnee Crain, Shaylun Grostephan, Shelby Smith, and Jacey Murphy. No. 3 Burlington (17-4) -- The Wildcats are looking to improve on their third place finish at state a year ago. Burlington can hit the ball and hit the ball far, as the Wildcats set a new state record with seven home runs in one game, while Delaney Hess set a new state mark as well with four home runs in a game. Hess leads the team with 10 home runs, while Rylie Hess and Izzy Thorp both have seven apiece. The Wildcats beat Anderson County and then Parsons to get back to the state tourney. Thorp hit a three-run home run in the bottom of the sixth inning in the regional title game to give the Wildcats the 6-3 lead they needed. No. 6 Prairie View (13-6) -- The Buffaloes qualified for state for the fourth year in a row, but this year with a little more to play for. Prairie View has lost in the first round each of the last three years, so the seniors on this years team want to at least play until Friday. Prairie View defeated Santa Fe Trail and Osawatomie to punch their ticket back to Emporia. No. 1 Riverton (23-0) -- The Rams are the defending state champions in 3A and they’ll be one of the favorites to repeat come Friday. The Rams beat Oskaloosa last year in a game that lasted 11 innings, but was ended on a walk-off from the all-time wins leader in the state of Kansas, Taylor Compton. Compton, the Rams’ ace and top hitter will look to keep the magic that they had last year up in Manhattan. The Rams will carry the program’s first unbeaten season into Thursday’s first round game. Sam Greninger does the catching for Compton and is one of the best in the CNC league, while Compton’s younger sisters Camryn (third base & a D1 commit to UT-Arlington as a freshman) and Jamee Compton (outfield) are all hard to get out. Look for the Rams to defend their state title with all of the right pieces. No. 8 Central Heights (15-8) -- The Vikings are headed to the state tournament for the first-time in the program's 20-year existence. Central Heights beat West Franklin, Jayhawk-Linn and Humboldt all to advance to Manhattan. Shelbi Hettinger leads the Vikings offense with a .488 average, while Demeree Pendleton (.394 avg) and Lindsay Burson (.348 avg) are three of the Vikings batting over .300 on the year. The Vikings will have their hands full with the 3A defending state champions on Thursday, but watch out for this Central Heights team and all the momentum they’ll be bringing to their first-ever state tournament. No. 2 Rossville (20-0) -- The Bulldogs are back in the state tournament for the first time in four years when they lost in the quarterfinals. Rossville has been unbeaten over the last two years in the Mid-East League and won their second straight league title. The Bulldogs have six players hitting over the .400 mark led by Kinlyn Lundin’s .551 mark. Giorgia Migliorini (.547 avg) is just behind Lundin’s top mark. Sara Shinn leads Rossville with 10 home runs on the year and Migliorini is just behind her at nine. Amanda Hill (11-0 record, 110 strikeouts and two no-hitters) leads the pitching staff, while Kelci Kippes (7-0 record, 36 strikeouts and one no-hitter) also causes havoc for opposing hitters. No. 7 Hays-TMP (17-6) -- The Monarchs will make their second consecutive trip back to Manhattan after working their way through the Russell regional with wins over Ellsworth and Russell. TMP fell behind early on in the regional title game to Russell, but they’d quickly erase the deficit and would route the Broncos, 11-1 in five innings. Bailey Lacy threw a complete game for the Monarchs striking out 11. TMP came into the 2016 state tourney as the No. 8 seed and was quickly sent home, so the Monarchs will try to make the stay a little longer this year. No. 4 Southeast of Saline (20-1) -- It’s not often that you enter the state tournament with one loss and still be seeded fourth, but that will be the case for the Trojans on Thursday in Salina. SE of Saline will be making their third straight trip back to the 3A state tourney after defeating Halstead, Lyons and Sterling to advance on. Kendall Schlesener threw a no-hitter in the Trojans’ regional semifinal win over Lyons and then threw a complete game in the win over Sterling allowing no earned runs, four hits and striking out eight Black Bears. Carter Brull, Kaylen Lassley and Morgan Thaxton all had multi-hit games in the regional finale and will try to carry that hot hitting to state. No. 5 Perry-Lecompton (21-2) -- The Kaws are heading to state for the first time since 2008 when they lost in the first round of the 4A state tournament. Perry-Lecompton won the Big Seven League and their two losses came to Valley Falls and Royal Valley. The Kaws have been putting up big offensive numbers all season long and 14 of their 21 wins are via the run-rule. Harleigh Robertson (.613 avg, 67 RBI, 13 HR) leads the Kaws offense, while Megan Fast (.603 avg, 32 RBI, 5 HR) and Cassody O’Connor (.597 avg, 31 RBI) are all lighting up the stat sheets as well. Fast is also the ace in the circle for the Kaws, going a perfect 11-0 with a 1.88 ERA and 73 strikeouts. No. 3 Cheney (20-1) -- The Cardinals are going back to state for the first time since 2014 when they lost to Riverton in the opening round. Cheney defeated Wichita Independent and Douglass to claim their own regional crown and advance to Manhattan. The Cardinals defeated Douglass 1-0 in a pitchers duel that saw just four hits, two apiece for each team. The only run scored on a fielder’s choice that ended up being the game-winner. The Cardinals and their five seniors will hope to keep their streak alive as they enter Thursday’s 3A state tourney. No. 6 Marysville (18-4) -- The Bulldogs are heading to state for the first time since they took third in 2013. Marysville defeated Riley County and Nemaha Central to punch their tickets back to Manhattan. Shelby Downard has been impressive all season long for Marysville and has posted a 17-4 record in the circle with a 2.35 ERA and 160 strikeouts. Downard is also hitting a team-best .592 with 36 RBI and 14 home runs, while Sydney Pacha is hitting .493 with four home runs on the year. The Bulldogs set a program best this year with 32 home runs, so we’ll see if they can continue to hit the long ball in Manhattan. No. 1 Sedan (21-1) -- The Blue Devils enter the state tournament as the No. 1 seed for the second consecutive year. Sedan won their first game last year before losing in the semifinals and settling for a fourth place finish. Sedan played Colgan in the first round last year as well with the Blue Devils coming out on top 5-3. Sedan defeated Oxford and Udall to earn the trip back to Pratt. No. 8 St. Mary’s Colgan (4-19) -- Although the Panthers have just four wins, you shouldn’t think lightly of them. SMC plays in one of the toughest leagues in the state filled with 3A & 4A schools, so they’ve been battle tested all year long. Colgan won just six games last year and still gave Sedan a run for their money in the first round, so we’ll see if they can do it again this year. Colgan entered regional play with just one win before paving their way right through the regional with wins over Chetopa, Uniontown and Oswego in the regional finale. No. 2 Chase Co. (21-2) -- The Bulldogs will make the trip back to the state tournament after missing out a year ago. Chase County posted three straight perfect seasons from 2013-2015, but were unable to qualify last year. The Bulldogs still own the state record with 94 consecutive wins from 2013-2016. Daryn Crawford anchors the pitching staff and has struck out 143 batters in 105 innings pitched, while also only allowing 13 runs. Crawford is also hitting .423 with 27 RBI, 14 doubles and a home run. Bailee Swift is hitting a solid .574 with 53 RBI and eight home runs. Swift will also be competing at the state track & field meet this weekend as one of the state’s top throwers. No. 7 Sacred Heart (15-8) -- The Knights advanced to the 2-1A state tournament after beating Sylvan Grove-Sylvan-Lucas Unified HSWilson and edging regional host, Brookville-Ell Saline to advance to Pratt. Sacred Heart has had trouble in the recent past getting by Ell Saline, but this year the Knights were able to pull it off. No. 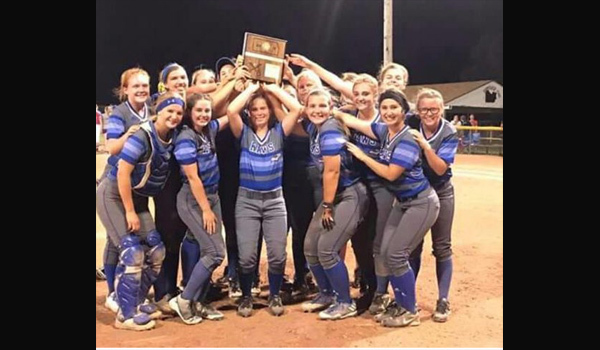 4 Ellinwood (17-6) -- The Eagles will soar into the state tournament riding an 11-game winning streak and just three of the wins have been decided by five runs or fewer. Allison Panning will be the Eagles’ No. 1 pitcher and will come in with impressive numbers. Panning has struck out 230 batters in 132 innings and also has an impressive 1.33 ERA. Brittney Beck is a threat at the plate for Ellinwood, leading the team with a .600 batting average, 39 RBI, 11 doubles, eight triples and four home runs. Katelyn Robinson (.439 avg, 19 RBI), Panning (.431 avg, 23 RBI) and Jenna Oelke (.426 avg, 8 RBI) are all capable of having big games. No. 5 Moundridge (15-7) -- The Wildcats are back in the state tournament for the first time since 2015 when they took fourth place. Moundridge is coming out of a weaker regional, where the No. 2 seed had just seven wins on the year. Jadah Moore leads the Wildcats in the circle, while Zizi Sebrant has provided some nice innings as well. Zaelynn Foth (.478 avg, 24 RBI) leads the Wildcats’ offensive attack, while Chelsey Knight (.448 avg, 24 RBI) helps provide a spark to the Wildcats offense. Knight and Sebrant are both quick on the basepaths and each have 22 stolen bases. No. 3 Leon-Bluestem (17-2) -- The Lions qualified for the 3A state tournament last year, but have made the transition back down to 2-1A and have found themselves in the state tournament again. Bluestem routed 13-win Flinthills, 17-1 to advance to Pratt. Natalie Bevan, Allison Burch and Ashtyn Jurging each had four hits in the regional championship game. Jurging got the win for the Lions in the circle and also homered in the game, along with Rileigh Boline and Paiton Haga. No. 6 Wabaunsee (15-8) -- The Chargers have been dominant this year on the girls sports side, as each sport has qualified for the state tournament. Wabaunsee enters state after a 8-0 win over Republic County to advance to Pratt. The Chargers have just four upperclassmen on the team. Autumn Schreiner is one of the underclassmen on the team, as a freshman Schreiner is the No. 1 pitcher and has 60 strikeouts in 87 innings pitched, while allowing 47 runs. Rayann Johnson, one of the two seniors on the Chargers team leads the team with a .418 average and five home runs. Abby Oliver also provides a nice spark and is hitting .411 with six home runs.